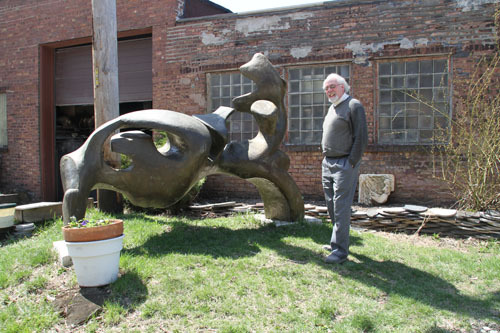 April 22, 2013: Visited studio of Swiss-American sculptor Jean Jacques Porret. 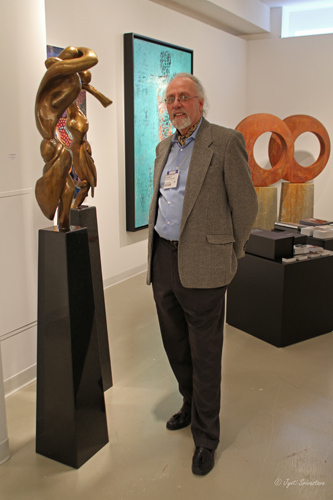 I have loved Jean Jacques sculptures from the very first time I saw them, at Art Chicago, Merchandise Mart . 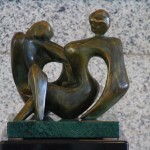 His abstract figures have a very lyrical, flowing quality to it. 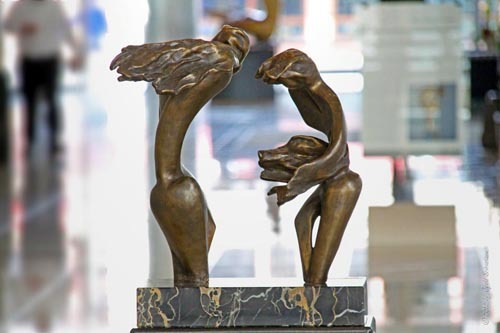 They evoke imagination and I can visualize people in these poses. I wanted to see his studio and today was the day. 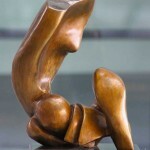 Check out his website www.jjporret.com.. 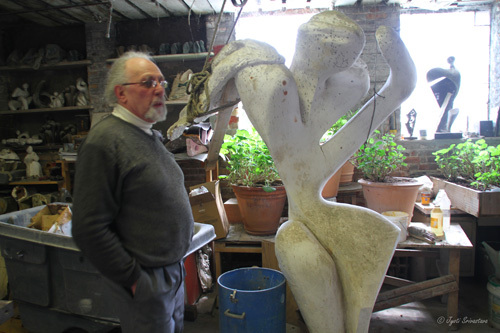 Here is Jean Jacques at his studio. 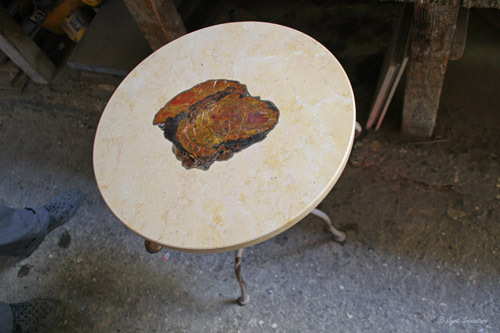 Some years back, he bought a granite and marble company, which is now his studio. 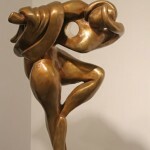 One result was that he started incorporating granite and marble into his predominantly bronze sculptures. 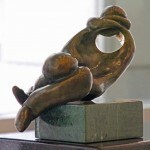 This also gave him control the sculpture base, which is very important. 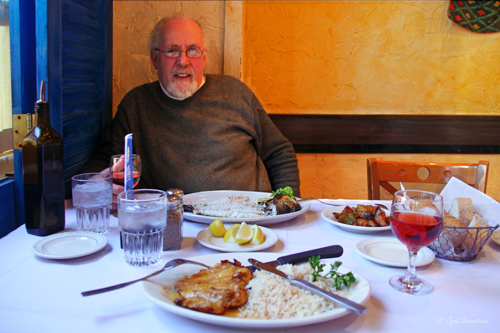 But, before I could take any studio photos, Jean Jacques took me for a lunch at Greek Islands restaurant in Greektown. The food was delicious!!! By the way, Jean also loves to cook, and on weekends he tries his creative skills on cooking. He said, he opens the ice-box and see what’s in it and what can be made out of whatever there is. 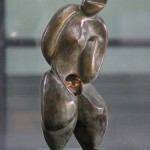 An artist using his imaginative skills in cooking was not surprising, but very interesting!!! I have always felt that conversations over the lunch are very relaxing and a very good way to know a person. I learned a lot about Jean, but I will not put all of my private conversation in a post, except for one thing. Jean’s academic background is that of a mechanical engineer. 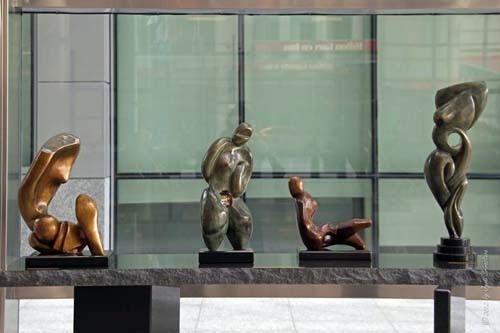 He also worked in a multinational company for many years, and later gave it up to pursue his artistic interests. After lunch, we went back to his studio. 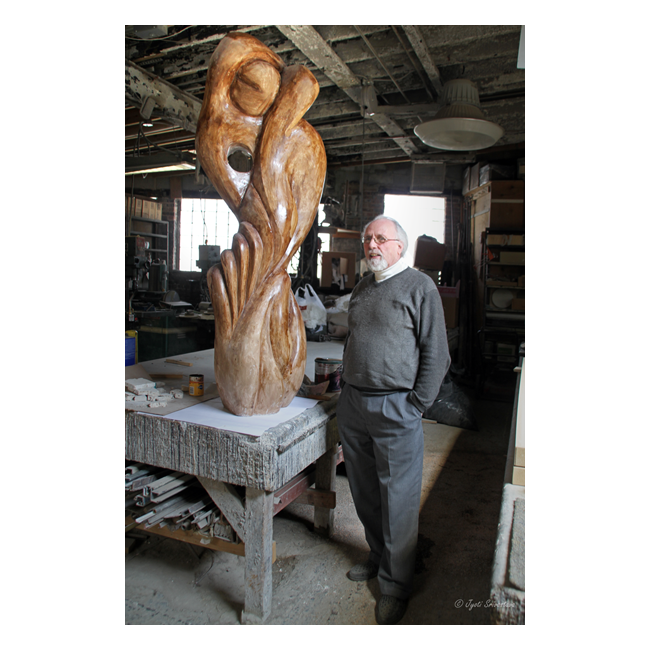 Coming back to studio, I saw Jean’s creations, his beautiful sculptures. 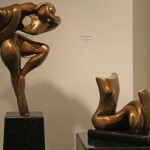 For a better look at these sculptures, check out his 2012 exhibition at AMA bldg. 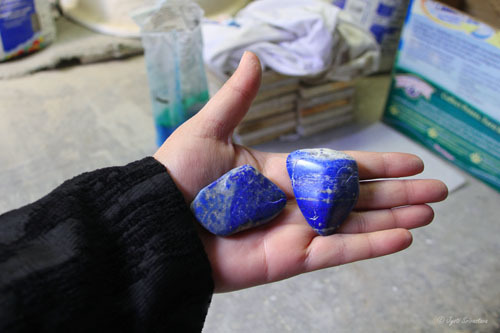 click here..
Jean had commissioned me to photograph the exhibition, and these images can also be seen in his website.. click here..
Lapis pebbles that Jean gave me..
With so many sculptures, there had to be a collection of molds. But as he was showing his studio, I saw something unexpected: his wine collection!!! He is a wine connoisseur and his collection are wines ageing from 1970s and even older. When I see this video I realize how silly I can be. It’s like a bucolic nincompoop meets a connoisseur of fine wines. Note to myself, learn to be more professional. But here it I,s my absolutely silly questions to Jean Jacques Porret! 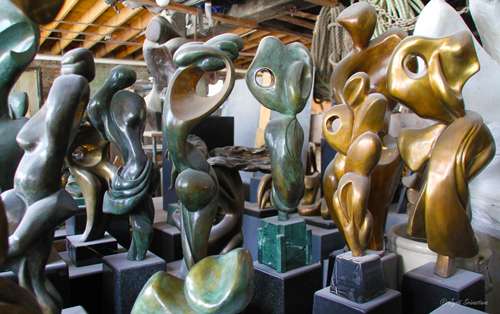 I think my trip to Jean Jacques’s studio was great! I enjoyed the visit and learned a lot about him and his creative side. 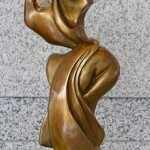 I believe that not everything is for putting in a post, so a lot of my enriching conversation remains with me. 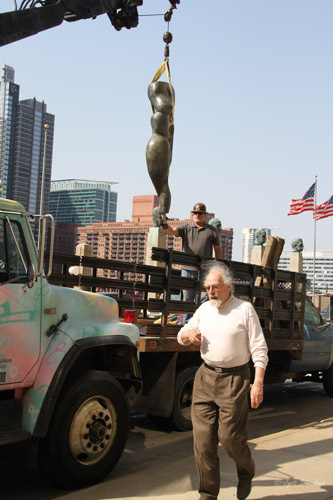 First time I met Jean Jacques was at Art Chicago, 2011; at Merchandise Mart, for the installation of “Flamboyante II” at Avenue of Sculpture by Chicago Sculpture International [CSI]. 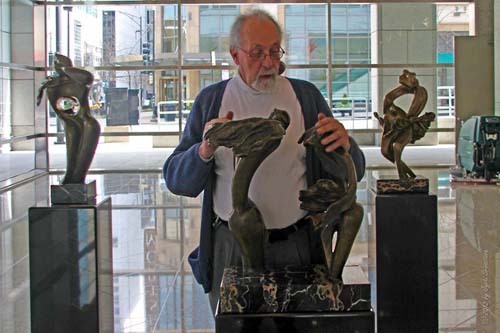 His bronzes were also exhibited in the Art Box gallery at Art Chicago, 2011.. click here..
As mentioned earler, in 2012 Jean commissioned me to photograph his exhibition at AMA bldg. here are some images from my photo-shoot. 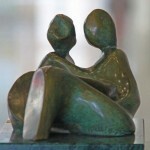 For more, click here..
Know the Artists series.. click here..